These are a must-have staple. They are delicious. Crunchy, tangy little pickles with the zing of onion. My restaurant will run a special on the Red Pickled Onion Burger. And, they’re easier to make than a peanut butter sammich. 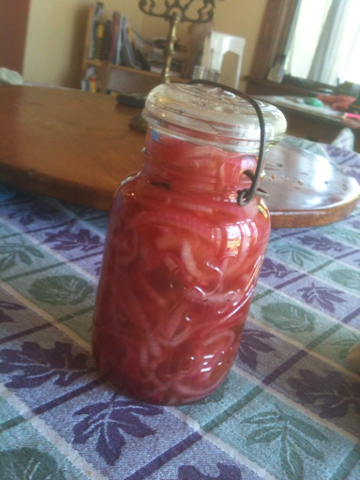 I used two red onions. Sliced them. Cried. Then I brought to boil 1.5 cups of white vinegar, several tablespoons of sugar, a pinch of salt, couplea bay leaves, five whole cloves, some peppercorns, a star anise, and a little heat. I threw them onions in there for a bit, maybe a minute, just to get ’em wet. It didn’t seem like the onions were gonna fit in all that liquid, but they did, and the onions sweat out a bit so they get smaller. Then you take them off boil, let the whole mess cool, and dump it all into the jar and the jar into the fridge. I gotta have these in my pantry man. They are so good.